Not magnanimous. Not even sacrificial. Just bigger. I had an experience this weekend that left me startled by just how small people can sometimes be. It was nothing earth shattering or insurmountable, nothing that put anyone or anything in harm’s way, but it was the kind of smallness that, if experienced too often would easily create a big tear in my perception and experience of the world as a typically generous, we’re all in this together kind of place. It was also the kind of smallness – selfish, like a child who just can’t bring himself to share a toy and controlling; the expressed insecurity of someone who feels that the world will spin out of control unless they remain the master of this small part of it – that felt painfully over-practiced, so routinized as to be unconscious. How can you not assume that this is just who they are? From my privileged perspective as the slighted one – and what a sanctified stoop on which to sit! – I reassured myself that I would never have done such a thing. And, perhaps I wouldn’t have, not in that particular situation. I, of course, have my own particular brand of smallness, as do we all. Not to paint with too broad a brush but this is a significant part of our human condition, is it not? I mean, it’s a tough and lonely world sometimes, and it’s easy to get lost in our own need to feel special, in control, at the protected and certain center of it all. When that gets threatened, or even if it is perceived to be, out come the small daggers thrown with precision at the target of our undoing. Feeling small and lost in the world sometimes is just part of the deal. There is no map. There are, however, lots of other people feeling exactly the same way, counting on us to ease the path, even just a very little bit. Let’s take a half-step towards bigger. Really. Let’s do that. As I was standing on the side of the road on Highway 46 at a spot I later learned was 10 miles west of Lost Hills, CA, I took a long look around. I’ve been in some remote places before – a section of the Great Wall of China two hours north of Beijing is pretty out there as is a stretch of Interstate 80 between the Nevada border and Salt Lake City – but this had them both beat. By a mile. Seriously and literally, there was nothing as far as I could see in any direction but flat brown fields. Except of course for the cars and trucks going by in either direction bearing toward their destinations with the same certainty I had been feeling about 10 minutes earlier. 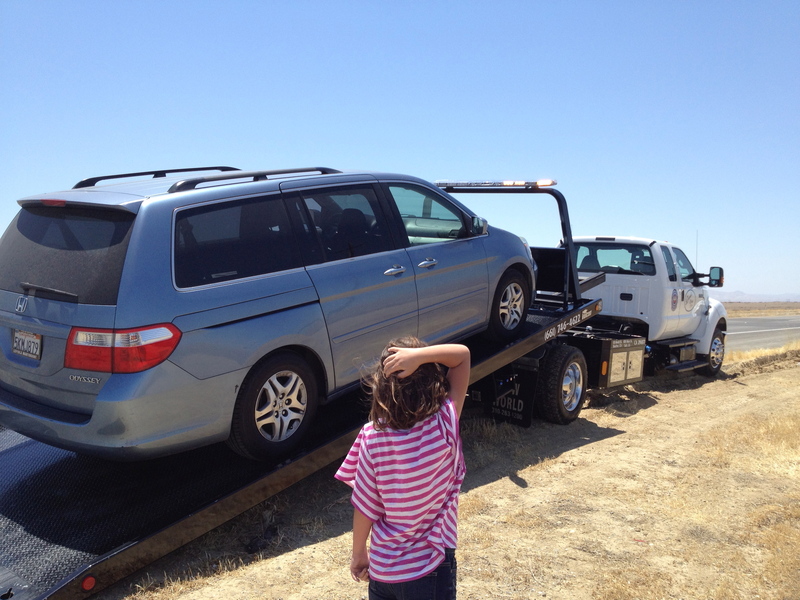 Until, of course, the transmission in our 2005 Honda Odyssey decided it had had enough. We were 3.5 hours into a loosely planned and highly anticipated summer vacation when circumstances dictated that our plans were going to loosen up just a bit more. At precisely 12:30 PM on that early June Saturday the entire Berry clan was on the side of the road wondering what was next. I was not terribly surprised by that fact that it was a hot day. (105 I later learned.) It matched the situation perfectly and served the purpose of heightening the anxiety of our situation. Though our cell phones were functional and we had a bit of water and a few snacks I still had a profound feeling of dread that would only grow as the day wore on, our plans completely at the mercy of a cast of unknown characters whose own agendas hadn’t previously called for our presence either. Cody proceeded to take us back from where we had already come (one of the highest ranking travel frustrations a person can experience, in my opinion [a nice corollary to my being in a big damn hurry, don’t you think?]) in search of a mechanic who could and would see to our difficulty, during which time I learned over to my wife and said: “you know, Deepak Chopra says that wherever you are is exactly where you are supposed to be. It is exactly what the universe has intended for you.” She smiled and I paused and then added: “I think Deepak Chopra is stupid.” But in my heart I knew he was right and as we motored on I could only wonder, why here? And, why now? If you ever need a mechanic in or around Wasco, California this is your place. 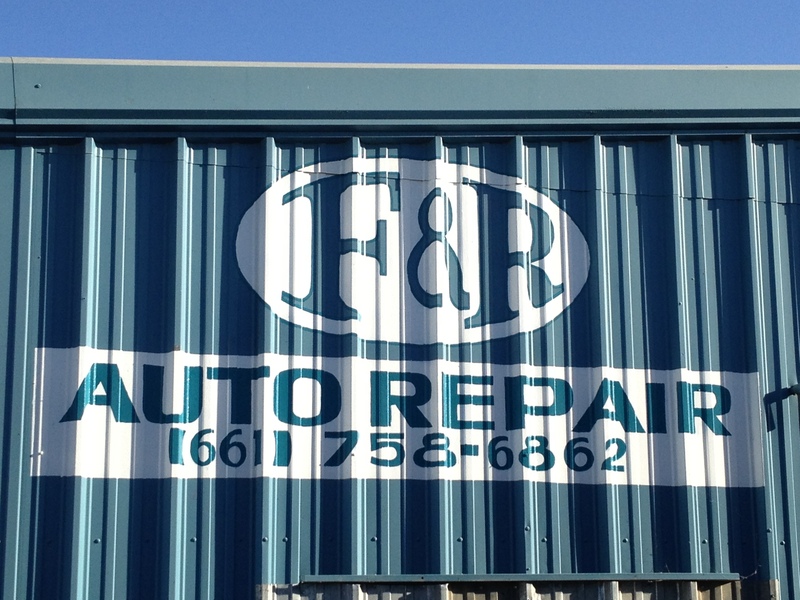 F&R Auto has seen guys like me before, especially when the temperature goes up. They are used to the urgency, the frustration, the pacing and the impatience. They are used to the beleaguered ignorance about how cars work and the time and effort it takes to fix them. Rafael let me know that Felipe is the “transmission guy” but that he wouldn’t be back for a “little while.” So, we went to lunch. When we returned, Felipe was back but my car was in the same spot out on the street. When he finally got to it at about 6:00 PM, four hours after we arrived, Felipe confidently proclaimed that he was 95% sure that a transmission flush and other stuff I didn’t understand would take care of the problem and we’d be on our way that very day. The people rejoiced and were buoyed by the promise of getting on with the trip. And, between them, the brothers F&R explained that a transmission repair/replacement would take at least one week and was, how shall I say it, not cheap. 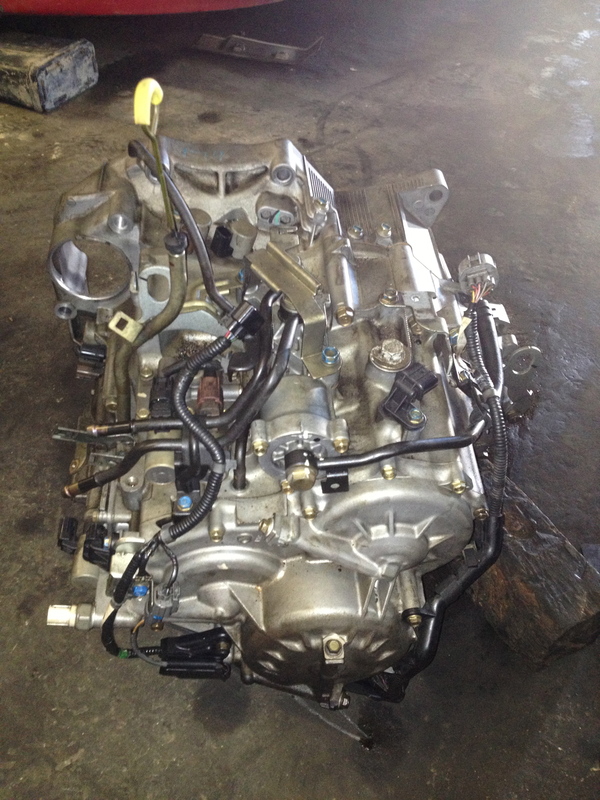 The failed transmission of a 2005 Honda Odyssey. RIP: June 8, 2013, 10 miles west of Lost Hills, CA on Highway 46. At this point the feeling of being stuck was growing quickly, led by the reality that we were. The nearestrental car option was 30 minutes away in Bakersfield but getting there was another matter. Until Felipe offered to let us borrow his car to make the trip. We accepted his gracious offer with the resignation that our car was staying put and we were hitting the road, further in the wrong direction in pursuit of a vehicle with which we could salvage our vacation. And this is where we hit the low point. Approaching the Avis and Budget rental car counters at the Bakersfield airport (Hertz had no more cars and National was closed. Saturday night, remember?) we waited as two parties in front of us returned keys to cars they had just occupied. When it was our turn to attempt to rent a car, however, we were told (in the most sickly sincere and sorry for your situation way possible) that THERE WERE NO MORE RENTAL CARS. If I thought we were stuck before, the feeling took on new heights as the pit in my stomach opened wider. My biggest regret in this whole experience is that I didn’t ask about the cars that had just been returned. I’m pretty sure the shock of the moment prevented rational thought but shouldn’t I have been able to count on the rental car guy to, I don’t know, see an opportunity to rent a car! Clearly, there are policies that prevent this sort of chaotic, rapid rental car turnaround and we were living proof of it. Damn. The drive back to Wasco was really tough. The kids we’re holding it together well but I was starting to come a bit unhinged. With the benefit of perspective and hindsight of course we weren’t really stuck. In this world, a working cell phone and a credit card is just about all you need to get out of a jam. But, the feeling…the feeling of having no control, of being at the mercy of our circumstances rather than being able to dictate them, was deeply humbling and desolate. Again, the loss of control was just so brutal. Yes, this is exactly where we were supposed to be – perhaps only to feel this feeling – and I hated every second of that drive back to Wasco. Somewhere along northbound Highway 99, coming out of the fog of my helplessness, it struck me that if Felipe was willing to loan us a car to drive to Bakersfield maybe he would rent us a car for the coming week. Maybe he would part with this big, beautiful bronze Suburban. Maybe this bruising, gas-guzzling beast was our way out of Wasco. He said “Sure. No problem.” And just like, we made a deal. 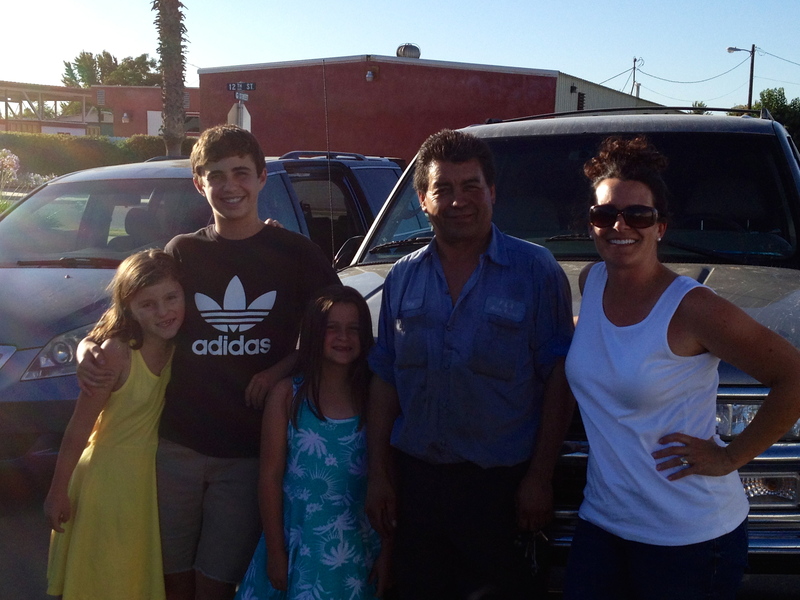 A grateful family poses with a generous man in front of the car he loaned us and the one he repaired. 1. Felipe and I made our agreement on a handshake. It’s been an awfully long time since I’ve done that. Sure, he had my car and knew I was coming back but, still, it was both welcome and refreshing. 2. People want to be helpful and sometimes you just have to ask for what you need. Felipe and Rafael were not only helpful but they did so in the most humble, simple way possible. At one point Rafael said to me: “I still believe there are good people in the world.” I know he’s right. 3. My control needs are massive. The fact is, I had to get out of there and anything short of that would feel like failure. By asking for help I was able to get my family back on the road. I was able to win. There’s a part of me that’s really proud of that initiative and that competitiveness. There’s also a part of me wondering why I couldn’t accept the reality of an overnight in Wasco and a return to the Bakersfield airport; why I couldn’t roll with it a little easier, turn it into an adventure, and just BE where I was in a more thoughtful way. I am a work in progress, this much I know. And, because I have many miles to go before I sleep I will strive to keep noticing, keep learning and keep evolving. And maybe, just maybe, the next time I’m in Wasco I actually will take some time to stop and smell the roses. I walked out of the house this morning, dog on leash, for my daily dose of exercise only to find a garbage truck broken down in front of our home. We never actually see the garbage man because he usually comes by much earlier and doesn’t hang around very long in the pursuit of his duties. As I approached I noticed him talking to another man, also from the “waste removal company” who had arrived in his own vehicle to provide service to the malfunctioning truck. When he saw me, my garbage man that is, he greeted me with what was truly one of the warmest, kindest, most sincerely expressed smiles and waves I have ever received. 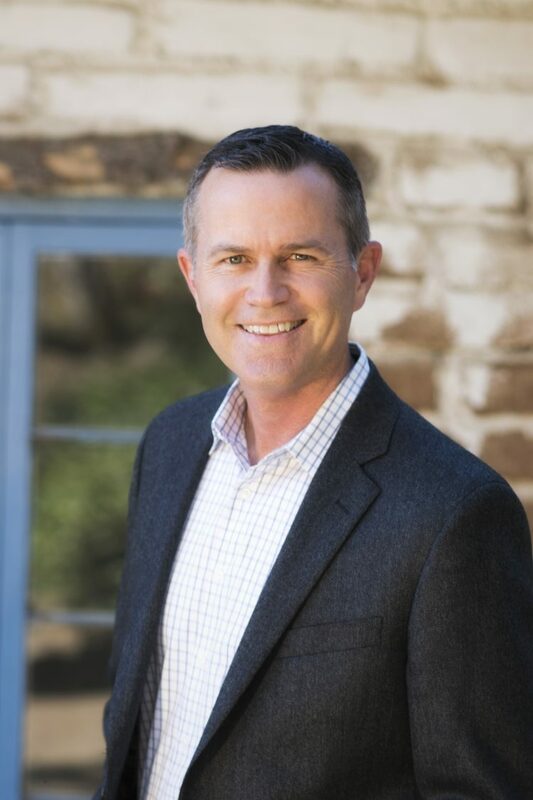 His energy and spirit of friendship was overflowing and the generosity of his offering it to me so significant that I was momentarily overwhelmed. This happened in an instant. I didn’t even break stride and I barely returned the greeting, so crushed was I by his unexpected goodness. All I knew in that moment is that my garbage man is happy. So much so that he can’t help but give it away. And as I walked on I could only ponder what impression I make on people in that moment, that briefest moment of unexpected interaction. Do they walk away “crushed by my goodness”? Do they get the best of me? Or do I offer something more calculated, more focused on preservation than generosity? My garbage man is happy. And I am, too. I wonder who knows it.